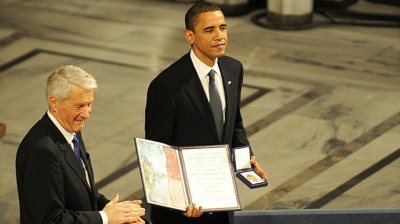 Nobel Peace Prize laureate Barack Obama poses with his medal. AFRICANGLOBE – On Thursday, the U.S. State Department approved the sale of more military equipment, valued at around $1.15 billion USD, to the oil-rich kingdom of Saudi Arabia. This sounds like a lot of money to most of us, but the most frightening aspect of the sale is that it represents a continuation of an arms-dealing relationship between Washington and the Saudi regime, which has been worth over $50 billion USD in arms sales to date. In 2013, the Obama administration loosened controls over military exports so military equipment could be sent to almost any country in the world with little oversight. U.S. companies began to enjoy fewer checksthan they had in the past. For example, thanks to the Obama administration, weapons manufacturers can now send military parts to most regions of the world without a license, which makes it easier for companies to extend their market — even to countries that are on the U.N. arms embargo list. This is because, according to Colby Goodman, an arms-control expert with the Open Society Policy Center, once an item is approved for that exemption, there may no longer be any ongoing, country-specific human rights review as had been conducted previously. Next articleWhat’s It Like Being Black In Italy?